Home Health Information Memory and Thinking: What's Normal and What's Not? Many older people worry about their memory and other thinking abilities. For example, they might be concerned about taking longer than before to learn new things, or they might sometimes forget to pay a bill. 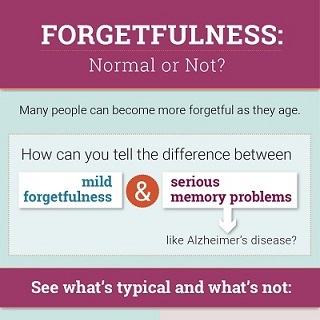 These changes are usually signs of mild forgetfulness—often a normal part of aging—not serious memory problems. Talk with your doctor to determine if memory and other thinking problems are normal or not, and what is causing them. Some older adults have a condition called mild cognitive impairment, or MCI, in which they have more memory or other thinking problems than other people their age. People with MCI can take care of themselves and do their normal activities. MCI may be an early sign of Alzheimer's, but not everyone with MCI will develop Alzheimer's disease. If you have MCI, visit your doctor every 6 to 12 months to see if you have any changes in memory and other thinking skills over time. There may be things you can do to maintain your memory and mental skills. No medications have been approved to treat MCI. Dementia is the loss of cognitive functioning—thinking, remembering, learning and reasoning—and behavioral abilities to such an extent that it interferes with daily life and activities. Memory loss, though common, is not the only sign. A person may also have problems with language skills, visual perception, or paying attention. Some people have personality changes. Dementia is not a normal part of aging. There are different forms of dementia. Alzheimer's disease is the most common form in people over age 65. The chart below explains some differences between normal signs of aging and Alzheimer's disease. The annual Medicare wellness visit includes an assessment for cognitive impairment. This visit is covered by Medicare for patients who have had Medicare Part B insurance for at least 1 year. Memory and other thinking problems have many possible causes, including depression, an infection, or a medication side effect. Sometimes, the problem can be treated, and the thinking problems disappear. Other times, the problem is a brain disorder, such as Alzheimer's disease, which cannot be reversed. Finding the cause of the problems is important to determine the best course of action. A note about unproven treatments: Some people are tempted by untried or unproven "cures" that claim to make the brain sharper or prevent dementia. Check with your doctor before trying pills, supplements or other products that promise to improve memory or prevent brain disorders. These "treatments" might be unsafe, a waste of money, or both. They might even interfere with other medical treatments. Currently there is no drug or treatment that prevents Alzheimer's disease or other dementias.